Printed by US Playing Co., the purple deck has stunning full bleed faces and brilliant court cards with gold and green instead of red and blue. This deck features gold and white pips. 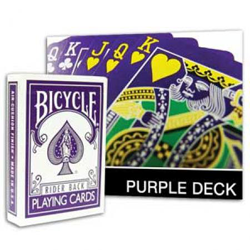 Beyond the 52 standard cards, this deck holds 4 special gaff cards - a blank face card, a double blank faced card, a double backed card, and a purple joker card.